The month of November always brings back sad memories for members of our family. Forty seven years have passed but we will never forget or understand what happened on the night of Tuesday 2 November, 1965. My cousin, Ross (short for Rosslyn) Evans was at the time an 18 year old medical student at the University of Bristol. Just before 10 o’clock that night, he’d been having a coffee with a fellow student in the refectory of their hall of residence – Badock Hall in the Stoke Bishop area of Bristol. He left saying he was going to call on another medical student in the nearby Hiatt Baker Hall of Residence. Ross never turned up for that meeting and has never been seen or heard of since by members of his family. Despite extensive enquiries by Ross’s parents and his uncle, in particular, at the time and for years afterwards, no real clues have ever been uncovered as to why a seemingly content and happy, bright student should disappear without trace. Ross was the second of three children born and brought up in Aberdare in the South Wales Valleys. Having won a Miners’ Welfare Scholarship at Aberdare Grammar School, Ross entered university as a second year student by virtue of his A Level results. He disappeared barely a month into his time at university. He had a happy home life, a girlfriend studying at Queen Elizabeth College, London and, according to letters home, a particular delight at being in college beginning a course he’d long set his heart on following. His room showed no signs that he intended leaving. He’d packed nothing, even his shaving gear was left behind in his room and he’d gone with only the clothes he’d been wearing. He left his books open on his desk, a sentence half completed in his notebook and his pen lying alongside, seemingly all ready to start work again. Although he’d suffered from asthma as a child, Ross was now in good health, he was very fit, had played rugby for his hall, dabbled in cross-country and enjoyed rock and mountain climbing, caving and ornithology. Organised searches of the area by police, soldiers and civilians, including some of Ross’s fellow students, revealed nothing. There was substantial coverage in local and national newspapers and appeals made on television locally but there was no real response. 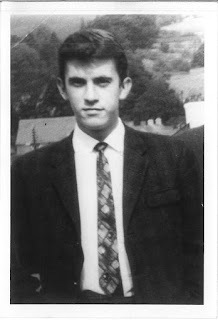 Ross’s parents in Aberdare and uncle in Walsall, West Midlands undertook their own extensive enquiries, distributing leaflets with his picture far and wide and contacting psychics, private detectives and clairvoyants, including the famous Dutch medium, Gerard Croiset, often consulted by Dutch police in missing person cases. Several theories were put forward and some followed up. For instance, the recurrence of the name ‘Alice’ led to Ross’s uncle writing to the local authorities in Alice Springs, Australia, and Port Alice, in British Columbia, Canada. This was only one of a couple of Canadian leads that were followed up – enquiries were also made in Montreal, the port to which the ship Halifax City had sailed out of Bristol on the morning after Ross’s disappearance. Ross’s parents died without knowing what happened to their son and those left behind still have no answers. The years pass but the questioning and loss remains. In many ways, not knowing is the hardest part. Had there been an organisation like Missing People at the time, I’m sure my relatives would have had greater support in their deep anxiety and, possibly, some answers. Writing in the mid-60s about the mysterious disappearance of a large number of young men and boys at that time, Tom Tullett, Chief Crime Writer of the Daily Mirror, said, “One of the shortcomings of our police system is that there is no central register of missing persons. What a boon it would be if, instead of having to circularise all forces when they find a corpse, the police could consult a central missing persons’ bureau.” (Daily Mirror, Thursday 26 January, 1967). The charity Missing People is a lifeline when someone disappears – the kind of lifeline Ross’s parents, brother and sister, and other family members could have done with back in the 60s and in the years that followed. It’s a wonderful, much-needed charity and deserves our support. What a powerful and tragic story. To know nothing after so many years - very very hard on everyone. My son went missing from our home in New Zealand 20 years ago, the search scenarios you describe so familiar. I just pray I will know SOMETHING before I die - and hopefully that's leaving a few years yet.